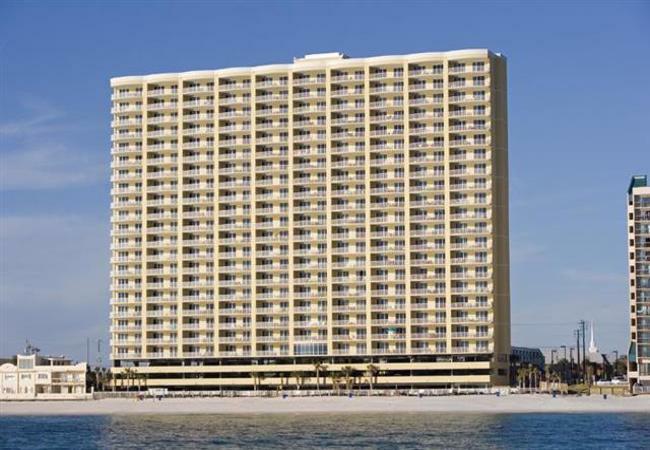 Emerald Isle of Panama City Beach Vacation rentals stands 23 stories tall with 199 fully furnished two bedroom/two bath units all with vast private balconies and all overlooking the Gulf of Mexico. This luxury condominium sits on the west end of Panama City Beach providing you with peace of mind both in location and value. You’ll find yourself away from the noise, but just moments away from the excitement and attractions along Panama City Beach. You may get spoiled by the location, but you’ll relish in the amenities that await. The Emerald Isle Beach Resort is stretched along 1,000 feet of beach in sunny Panama City, Florida. Featuring endless vistas of the Gulf of Mexico, this beach community is unlike any other in the area. Enjoy your morning coffee, tea or juice while watching the dolphins play at sea. Then, off you go to the 5,000 square foot fitness center to get in your morning workout. After relaxing a bit, you decide to take a dip in one of the three pools and the complex. As you lounge poolside, you gaze out over the gulf with a sandwich from the onsite deli and a cooling frappuccino from the Starbucks located here. In the late afternoon, enjoy hearing the waves tickle the sands of the beach. As the ocean breeze kisses your skin, you marvel at the wonderment of life over a meal on your spacious balcony overlooking the sea. At the Emerald Isle Beach Resort, you get the following in beach condo living, three pools, 5000 sq. ft. fitness center, steam room, hot tub, day spa and much more. Emerald Isle Beach Resort is close to major area shopping, entertainment, nightlife and more. Pier Park, the 900,000 square foot mega-entertainment and shopping complex is a haven for area fun in the sun. Pier Park features high-end and economy retailers, all under one gorgeously designed roof. For example, there’s Ann Taylor, Dillards, Old Navy and JC Penney’s and a host of other stores. From steaks to burgers to seafood to pizza, you’ll find it all at Pier Park. Some of the delicious eateries you’ll find here are Jimmy Buffett’s Margaritaville, Longhorn Steakhouse, Olive Garden, and more. Emerald Isle gives you the place where you can make a lifetime of vacation memories for you and your family.